1961 C1 CORVETTE LEATHER SEAT COVERS. 4 PIECE SET OF COVERS TO REPAIR BOTH SEATS. STRICT ATTENTION TO DETAIL AND WORLD-CLASS CRAFTSMANSHIP! Log In To See Pricing 1961 C1 CORVETTE VINYL SEAT COVERS. AL KNOCH REPRODUCTION. SEE PAGE TWO FOR COLOR SELECTION. 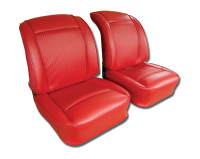 Log In To See Pricing 1961 Corvette Seat Foam Set. 4 Pieces. Brand new replacement foam cushions to repair both seats. Log In To See Pricing 1953-1955 C1 Corvette Seat Spring Unit Bottom - Correct Reproduction Springs.